France - The Ocean control desk is a lighting console designed for theatre, opera and multi-purpose venues and is based on Hathor software. View the stage from any perspective: the high resolution compact touch screen is designed to give a clear view of the stage regardless of where the operator is sitting. 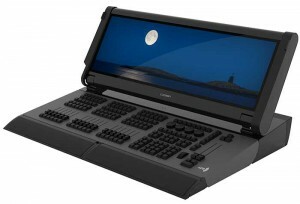 The 70cm-wide screen viewing area ensures full access to all the functions and parameters. The Ocean is only 816mm wide and 544 mmdeep. It can be placed virtually anywhere, with its conveniently accessible touch screen. Four Ethernet outputs cut down the use of additional Ethernet switches. Lighting networks, visualising software, back-up consoles and any other devices can now be connected to the Ocean thanks to the four independent Ethernet outputs. 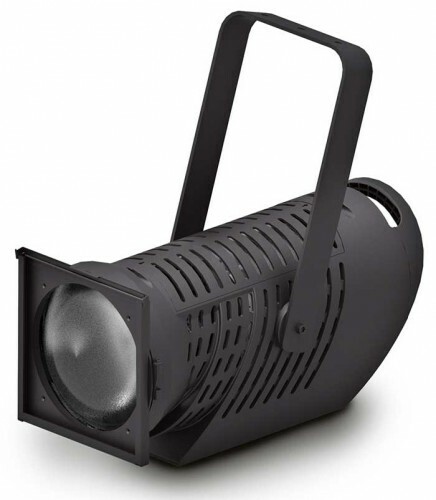 The Orkis is ADB’s new colour LED Fresnel luminaire, which brings the modernity of innovative technology to the stage in a simple, versatile, heavy duty unit. Its CRI remains stable at values of at least 97 due to a modern six-colour LED system and advanced software. The Orkis’s performance really comes into its own in colour production: the colour range obtainable is very wide, and every shade can truly be achieved. 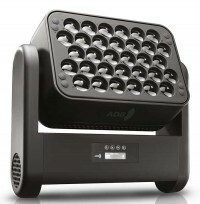 It faithfully reproduces the behaviour of a halogen light, making it compatible with various different light sources. The Orkis is also an extraordinary variable white LED unit, from 8000K to 2500K: the white light it produces is extremely pure since it combines six colours, and the CRI is unaltered when the colour temperature changes. Its flexibility of use is remarkable: a flood light up to an angle of 87° (field angle), or a spot light with an angle of 15° (beam angle). Variation is continuous, smooth and linear within this range. Alternatively, the Orkis can be modified into a PC luminaire, by changing the lens with the related accessory. The Oksalis is a static LED washlight which gives you total control over the quality of all forms of white and coloured light. The Oksalis washlight is based on HCR (High Colour Rendering) technology, a LED light module consisting of six chips, each one devoted to a different colour: amber, cyan and lime have been added to the three classic basic red, green and blue colours. The Oksalis and Klemantis share the same light technology. Together they form a product line able to provide a very wide colour range with an extraordinary colour spectrum coverage, and different shapes and light distributions. Klemantis is an asymmetric cyclight based on a six-colour LED module, which uses cutting-edge HCR (High Colour Rendering) LED technology to deliver a wide selection of colours from bold hues to pastel shades. The new extensions to the Klemantis family are the more compact 500mm version ( Klemantis AS500) and the new symmetrical optical units available as accessories. The new HCR technology used in the newest ADB luminaires is an exclusive electronic platform developed by ADB and Claypaky in conjunction with Osram. The ADB projectors based on the HCR technology are also extraordinary variable white LED units, from 8000K to 2500K, the white light they produce is extremely pure since it combines six colours, and the CRI is unaltered when the colour temperature changes. The Lexpert family is a range of LED units featuring advanced digital technology and extremely high quality light. The Lexpert fixtures are designed for those who appreciate the advantages of LEDs, but still prefer white light sources, a step towards the future, but with respect for the ways of those who have to use them. The Lexpert profile spot and Fresnel lights feature white-LED solutions for replacing 1kW halogen lamps. The series includes the compact and versatile Lexpert Emphasy. Lexpert units are guaranteed by Osram and ADB's long experience in the lighting industry. They provide excellent value for money. ART Centric Lighting by ADB, recently awarded as “Best Lighting Product” at LDI 2018, is a collection of lighting fixtures that prioritises the most effective ways of lighting works of art, both from a technical and narrative point of view. Highlighting the artist’s message and making it live in the visitor’s eyes means enhancing the physicalness of the work itself, without altering it. The basic principle behind ART Centric Lighting is therefore to respect the works of art, and turn them into stars, like actors on a stage. 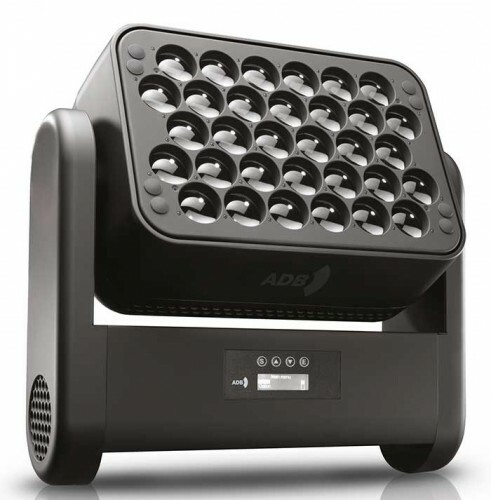 It is by no coincidence that the small ART Centric lighting units are in reality miniature theatre lights, made by ADB, a company with a long history in the theatre world. They are not simply light sources with an elegant non-invasive design, but are fixtures with professional optical units that generate high-quality, adjustable light. The Art Centric Lighting team of experts is on hand to offer museum curators and private collectors of works of art specialist advice, ranging from the choice of the most suitable lights for each situation to installation design and control systems.